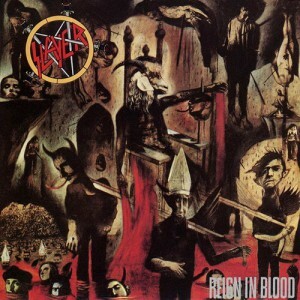 Reign in Blood is the third album by thrash metal titans Slayer. Released in 1986, the recording is exceptionally clear for a time when figuring out how to record metal albums was coming out of its infancy. For comparison in sound quality you only need to look back to their 1985 album Hell Awaits to hear the difference. Acclaimed producer Rick Rubin is often cited for this and it contributed much to the success of Reign in Blood and its iconic status that it has attained over the subsequent decades. Slayer obviously took their punk rock influences to heart and upped the ante for thrash metal by pushing the subgenre to its limits and did so with categorical success. The original release of Reign in Blood is incredibly short. 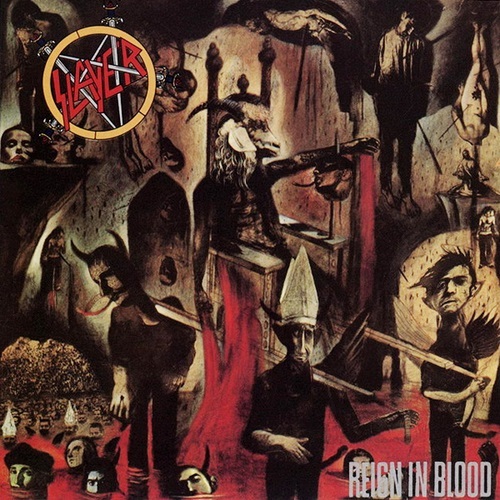 It is a relentless 29 minutes that showcases an odd disparity between Slayer’s savage song writing abilities and the sloppy guitar solos that get jammed in thoughtlessly and appear to be more of an afterthought than an integral part of any of their songs. Thankfully Dave Lombardo will distract you from this with his masterful drum work that parades throughout Reign in Blood and he never misses a chance to impress. Tom Araya’s vocal performance goes all the way from barely comprehendible splutters, snarls and high pitched screams to relatively even singing with a gruff slant to it. The lyrics were written by the guitarists Jeff Hanneman and Kerry King and deal with horror, gore and violence while touching on Satanism and death. While shocking for the time, these topics have since become standard fare for many thrash and death metal bands past and present. Reign in Blood is a single-minded barrage of aggro in short, snappy bursts that doesn’t leave any room to flex their artistic muscles in other sonic realms. Slayer used their unquenchable thirst to create volatile music and spurred them on to record an album that ultimately became not only a flag bearer for thrash metal but a forerunner of death metal as well.